Want something daring and fun to wear? Then this cross strap + sweetheart neckline top is a great top to experiment with! This can adopt to numerous form of style genres, depending on your preference and mood. 1. COSMOPOLITAN PARTY GIRL: Pair with black shorts, long, layered necklaces, mettalic heels and clutch. 2. MODERN BOHEMIAN: Wear it untucked with a long tiered printed skirt, strap sandals and satchel. 3. CASUAL WESTERN: Wear with denim shorts, brown boots, chaleco and soft leather messenger bag with fringe. 5. DAILY STYLISTA: Pair with skinny jeans, printed shoes, any handbag, your favorite accessories. 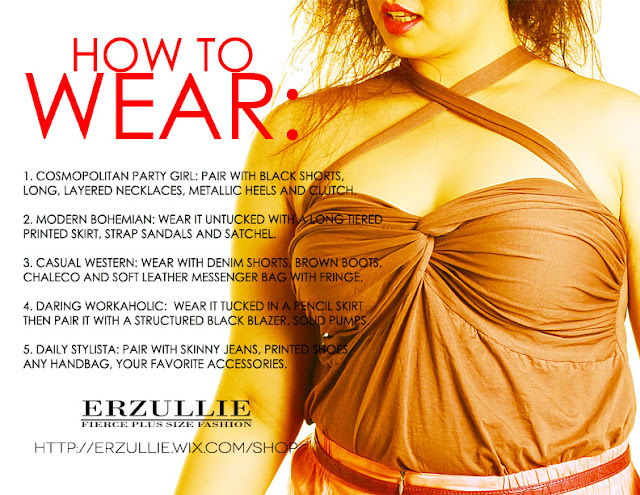 This top and other fierce plus size fashion is available online or at the Erzullie Pop Shop on May 18, 2013, Saturday, (6:00pm-9:00pm) at the Caffeccino Function Room, Caffeccino, Eastwood City, Quezon City.